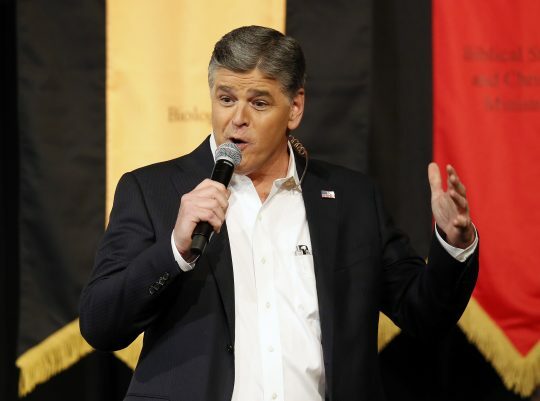 Fox News host Sean Hannity said Monday evening that he is not planning to leave the cable network following news of his co-president and long-time friend Bill Shine's resignation. Hannity's denial came amid reports of an alternative conservative network attempting to lure him away from Fox, as well as information about his contract, which allows him to leave the network if former Fox News chief Roger Ailes left. But the "Hannity" host tweeted an article denying that he was "negotiating an exit" from Fox, Politico reported Monday. Shine joined Fox News in 1996 with Hannity's help and reportedly had a "decades-long friendship and working relationship" with him. Hannity warned last week that Shine's departure from Fox News would spell the "total end" of the network "as we know it." Politico asked Fox for comment, but a spokesperson referred the publication to Hannity's tweet from Monday night. The Washington Free Beacon reported on Monday that Shine resigned after Hannity tweeted on April 27 that "somebody HIGH UP AND INSIDE FNC" was trying to get Shine fired. The contract Hannity signed would run through 2020, but could end earlier if Hannity decided to exercise a clause allowing him to leave after Ailes' departure. Ailes resigned from Fox News last year after former Fox anchors Gretchen Carlson and Megyn Kelly claimed Ailes harassed them. Former Fox host Bill O'Reilly was forced out last month after allegations of sexual harassment. Hannity's decision to stay at Fox came after Kelly and fellow Fox host Greta Van Susteren left as well. This entry was posted in Uncategorized and tagged Bill O'Reilly, Fox News, Greta Van Susteren, Megyn Kelly, Sean Hannity. Bookmark the permalink.